The Apartments are 40 minutes from Ballina Airport , 60 Minutes from Gold Coast and 90 minutes from Brisbane Airport. Local shuttle buses are available. Two bedroom apartments, with ocean views, are situated on beautiful Main Beach, right in the heart of town. These two bedroom apartments are located in one of the most popular areas in Byron; on Lawson Park overlooking Main Beach. This is the perfect place to laze on your balcony and soak up the holiday atmosphere. The ground floor apartments have a queen bed in the master bedroom and 3 singles in the second bedroom, plus direct beach access. The upper level apartments have two queen bedrooms with ocean views. 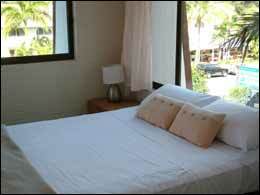 Main Beach Apartments are air conditioned and there is secure lock up parking. The beach is on your doorstep, and local restaurants, cafes and bars are only minutes from your accommodation. Experience the unique atmosphere of Byron’s town centre. Close to everything Byron has to offer including a variety of restaurants, cafes and boutiques right on your doorstep. The pristine beaches of Byron Bay are only a short leisurely stroll from your holiday accommodation. The apartments are located on Main Beach, right in town centre.